The Midwest boys dominated and the heart land boys did well. It is setting up to be a very competitive footlocker for the Midwest Regional. Fayetville manlius. 2nd on boys side but first on girls side. Has won girls 11 out of past 12 years. Personally I just don’t get how that’s possible on a national level. I get it on a state or even a regional level especially a great program, huge school, great coach but not a national level. Winning nationals 11 out of 12 years. Baffling how this is possible. Then again the east coast women in general were animals individually and as a team. The girl winner would have been middleton boys number 4 runner and if she was pushed she could have potentially run faster than middletons number 2 runner and middleton is potentially the best team in wisconsin modern history. As great as a season middleton had I think this meet also shows them how much further they need to go to be relevant and with one of the worst 6-7 guys replacing their 2 and 5 it’s not a slam dunk we will see them at nationals next year unless they again like this year show a lot of improvement. I do believe Caleb can be a top 20 in the nation guy like vanucci ellenburg and obviously meinke (probably the 10th returning underclassman) but what I believe is irrelevant Caleb needs to believe it too like he did at heartland. Anyway he was a team player this year but next year he may need to be a low stick guy on the national scene for them to be a top 7 team type team. Unless this national course was killer tough it looks like our Wisconsin guys were beyond their peak for sure. Pretty much everyone except Bosley and Meinke ran quite a bit slower than they did at the Ridges a month ago. I imagine some of that is due to the draconian WIAA rules that don’t allow coaching your athletes that are running in post season national competition. It make it all the more amazing that our kids have done quite well over the years. Hacker did have his dad to coach him and use his PHD in exercise physiology to help his son advance through the post season. 7th at NXN and 7th at Footlocker for Bosley. He ran as good as possible as 5-20 were pretty equal in capability and all was close. If anything it was unfortunate 2 other juniors squeaked right in front of him in the final 400 meters but it was a big pack of guys going back and forth and will provide extra motivation for track and next year. The first 800-1600 was too slow which made it a weird race. The sophomore who was in second place looked very fresh and may have won it if he ran for the win instead of running for a top 3 position. Not sure how tall he is but he was just loping out there and if he stays healthy could be amazing. Hopefully Bosley wins it next year but the main thing is to just stay healthy as he has already proven he is great. 3 of the probably top 5-6 returners in the country are from Texas next year (some may argue the top 3 in terms of talent) but beyond Texas, wisconsin should have one of the top front pack of individuals in the country next year and has a chance of being one of the top 3 state meets in the country for boys similar to Illinois and Ohio this year and should bring extra collegiate interest to the rest of the wisconsin field. Congrats to Dylan Jacobs who overcame 3 dissapointing races in a row to then turn it around and win nationals. Clearly the times were very slow overall which kind of shows how great Finn and Olin races were over the past 5 years both running almost 40 seconds I believe faster than Bosley on the same course and similar conditions although the weird opening mile was the primary culprit for the slow times. Similar to our state meet mile last year. Bosley intro bookmarked first. Hit stop and run the second video (same video) to see the start of the race. 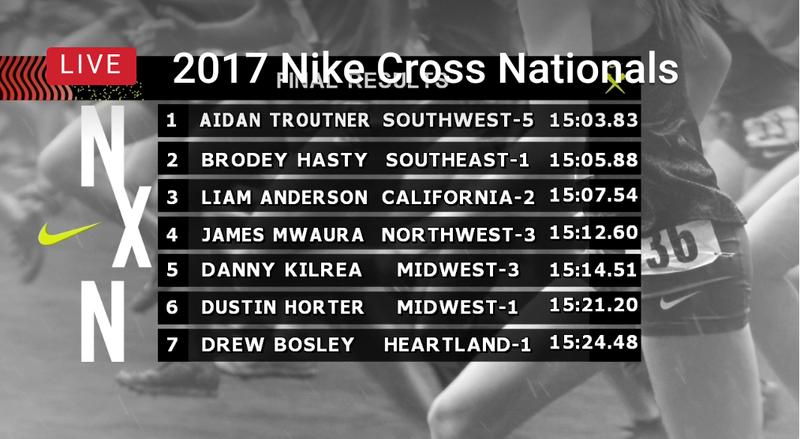 The Midwest had 7 of the top 13 boys in the race. That is 7 compared to 6 from the other 3 regionals combined. Even the last place guy from the Midwest was 27th. The girls had 5 of the top 10 and the last place finisher from the region was 30th. Maybe it is time to divide the regional into 2 smaller regions. They would probably never do it but it may help slow the drag that NXN is placing on Footlocker. There is significant travel for some kids to get to regionals for Footlocker but all of the NXRs are within an 8 hour drive. It looks like the 11-20 finishers from Midwest would have been likely qualifiers at other regionals. altitude makes a difference I guess.